Top : Propulsion : Drives : North American Marine Jet Inc. Manufacture of High speed and low speed jet drives. The only jet manufacture to produce high thrust water jets for speed ranges of 0 to 20 knots with our TRAKTOR JET HT series and 0 to 30 knots with our TRAKTOR JET HH series. 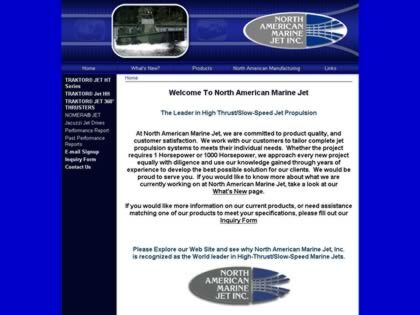 Web Site Snapshot: If available, above is a snapshot of the North American Marine Jet Inc. web site at http://www.marinejet.com as it appeared when this site was added to the directory or last verified. Please Note that Boat Design Net has no involvement with the above web site; all content and images depicted in the above thumbnail are the property and copyright of North American Marine Jet Inc. unless otherwise noted on that site. Description: Manufacture of High speed and low speed jet drives. The only jet manufacture to produce high thrust water jets for speed ranges of 0 to 20 knots with our TRAKTOR JET HT series and 0 to 30 knots with our TRAKTOR JET HH series. Visit North American Marine Jet Inc.